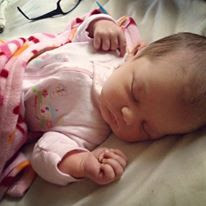 One week ago today, I went to my midwife for my weekly visit. I was just a few days shy of being 42 weeks pregnant. I was feeling anxious for my new little one to arrive but knew I needed to try and let the baby come in it's own time. I went ahead & got an exam that day to see how things were going - the week before I was barely dilated and had not had any contractions/signs of labor. We were both still healthy and progressing fine. The midwife said I was dilated to 3, possibly 4 after my visit (which I was pretty excited about) but my cervix was still quite firm. So we joked and talked about how we figured it would be that coming weekend - Easter - when I would probably go into labor. The midwife, her assistant, and her student in training headed out and I texted my friend/doula and called my parents to let them know what was going on. (They were going to take care of my kiddos.) I told them I didn't think they'd have to rush because everyone was still asleep and I had just called the midwife. 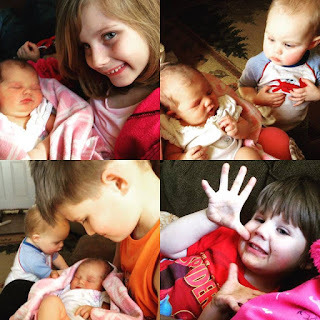 In hindsight, I often don't realize how far along I really am, or perhaps things just go faster now that I've had several kids. Everything after that is a blur to me. I remember certain things but I don't really remember when they all happened exactly - I'm blaming it on lack of sleep right now! So just FYI, I may be a little off on the specifics. 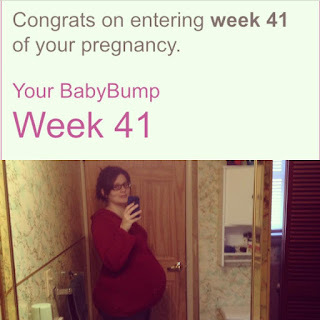 My legs started shaking and continued to shake for most of the rest of my labor - due to hormone changes - that was kind of irritating but not a huge big deal. (I have had it happen before but this time it was pretty intense.) I labored laying down in the bed or standing up for quite awhile, with my doula/friend applying a heating pad to my back and or holding my hands/holding onto me. After my midwife and her crew got there they started getting everything set up - our birth kit unpacked, sheets on the floor, tools/instruments out, etc. Labor I felt like was very manageable - I remember during my previous two labors having some moments where I felt like "I don't know if I can do this" and I can honestly say I never felt that during this labor. 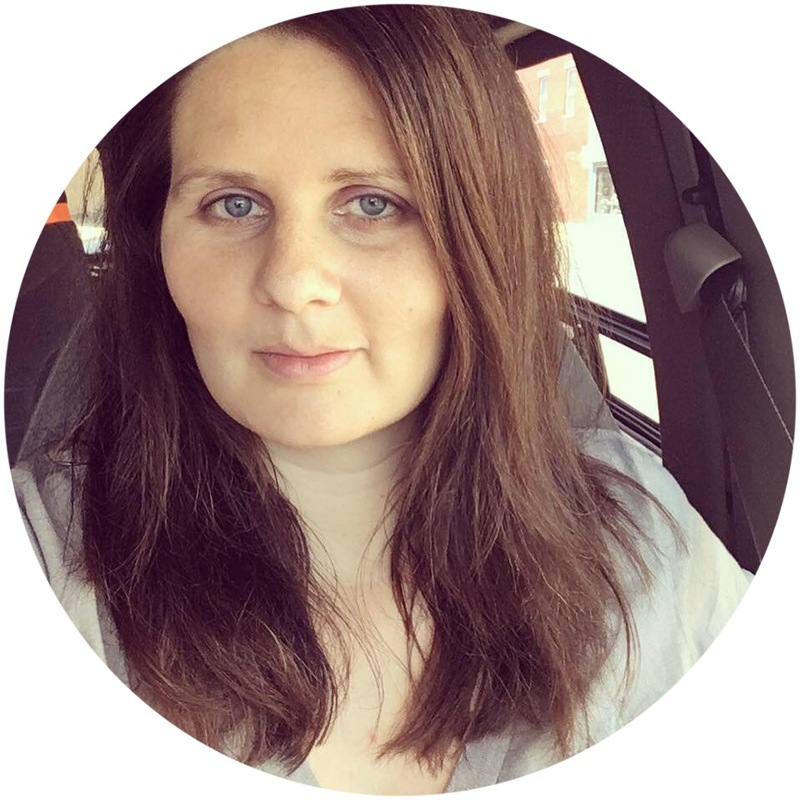 I felt very capable and despite all the nervousness and anxiety I'd been having during my pregnancy, I didn't feel that during labor. I was able to do a lot of positive self-talk in my head and listened to my doula/friend telling me I was doing a good job, to breathe, etc. I could tell that this baby was smaller than my last two just by how I was feeling. Labor progressed along quickly and easily. My midwife and her student monitored baby's heartbeat on and off. I got up to go to the bathroom at one point in time - I believe it may have been when I was starting to transition - and I remember feeling really, really nauseous. I asked husband if he could get me a Rolaid or Tums or something to try and settle my stomach. (Or maybe I asked my doula/friend and she asked him, I don't remember exactly.) He was gone and back in a flash but I could feel myself starting to gag already - so my friend helped me get to the bathroom and I puked. Again, not pretty but birth is like that sometimes. I have never puked during a labor so this was something new! After that, we moved back into the bedroom and I got down onto my knees and leaned over the bed. 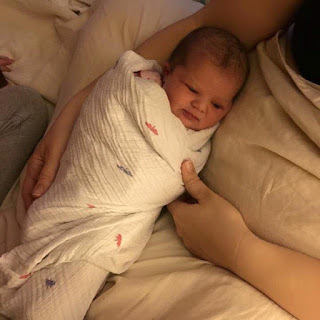 I initially had been having quite a bit of back labor until the baby moved down further and then I felt like some of the pressure was taken off of my back. Moving into that kneeling position was also very helpful. Husband got down onto the floor with me and applied counter-pressure to my back which felt horribly awesome. I know that doesn't make sense but it truly did feel painful and helpful at the same time. I finally started feeling "pushy" and the midwife knew it from the sounds I was making. (She is seriously awesome and intuitive.) I pushed for ten/fifteen minutes and all I could think about was finding out whether we were going to have a little girl or boy! 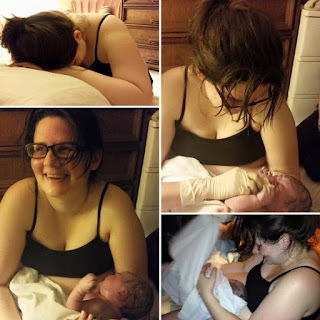 As the baby emerged, husband was able to get a hand on our new babe, my midwife helped him, and then I pulled our sweet little one up into my arms. That is a truly amazing feeling - to physically birth a baby out of your body, and then to gather that new little person up into your arms. There is absolutely nothing else like it in the world! Someone (midwife's student I think) wrapped baby in a blanket and the midwife began checking everything out. I had not even looked to see if we had a boy or girl yet - I was just in awe. The midwife said, "Look and tell us!" to my husband. I opened the blanket and husband revealed that baby number five was......a BABY GIRL! I was so excited. Of course I would have been happy with a boy too but my gut had said the whole time that it was a girl. Something funny: when baby girl let out her first cry, her little brother Hezzy who was asleep down the hall in his room, woke up and started crying. :) My parents had just gotten there so they got the kiddos out of bed while I got all cleaned up and settled into the bed. The kids and other family came in to greet our newest little lady and we began trying to breastfeed. She had a little trouble at first but now is doing beautifully. Husband and I also took some time to debate her name. I loved being able to take our time and just sit and talk about it. We decided on Elizabeth Rose and I think it suits her. Elizabeth will be one week old tomorrow and things are going pretty well. Of course there's adjustments and things are crazy loud here at times, but the kids are all troopers and my husband is such a wonderful partner to have. We are a true team right now, working together, figuring out our new normal. I am so glad to share this journey with him. <3 I am also blessed to have family members and dear friends who have been stopping in, bringing food and supplies, and otherwise checking in to see how things are going. I thank God for this support and the wonderful new life he has blessed us with.